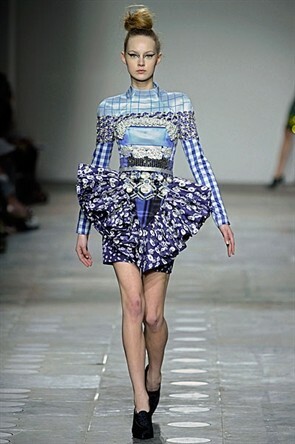 Katrantzou's nine piece collection for Topshop was the fastest selling collaboration in the chain's history. Im so jealous of all the people that own a piece! 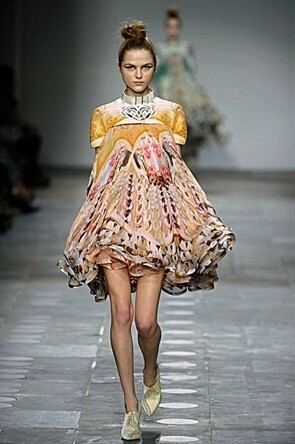 Her collection at London fashion week was one that caught my eye the most. There is something amazingly simple about the shapes of her garments even in the free flowing layers of skirt and yet there is a feat for the eyes. Her prints are only something I could ever aspire to create. I feel really inspired by the graphic style being used on sheer fabric yet also on structured garments showing how versatile the style of print is. Her construction style makes me feel wonderful as well, beginning by designing the dress in a size 14 then cutting down to a size 8. She says 'With the interior collection, we just added more information. So, on a size 8 you get the sofa, the mantelpiece and the flower whereas on a size 14 you get the the sofa, the mantelpiece the bush and the room next door'. I hope one day I'm successful enough to be able to afford one of her dresses, i'm just in love with them. Hi ! Fine blog ! So amazing ! Come to visit and follow mine... I'll follow you back ! Oh, these looks are amazing! I love it! 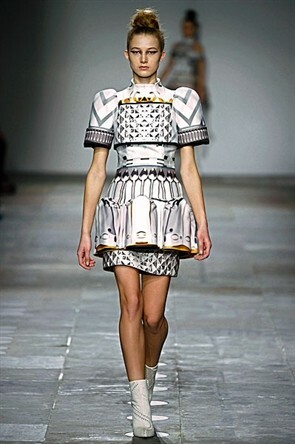 Love her collection the structure of the bottom right dress is so amazing!